Central Yacht has given Boat International an exclusive tour of the Benetti superyacht Lady Candy, plus its new 56m project with the yard. 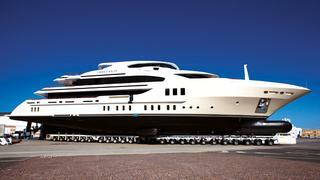 Paul Brackley, of the yacht design and project management company Central Yacht, created 56m Lady Candy ‘from the inside out’, as he puts it, based on his experience as a superyacht captain. The aim was to develop a highly efficient design, which maximises space, improves service and onboard experience, while at the same time reducing the number of crew necessary to run the boat. The altogether innovative layout features two upper deck suites: a VIP forward and the owner’s suite aft, designed originally with charter in mind (to avoid two principles arguing over who gets the best cabin). The aft space features a comfortable sitting room and office that can be made shared spaces with the VIP, or screened off to create an impressive owner’s apartment. The VIP suite’s entrance lobby and the owner’s suite’s sitting room are positioned so that those who enter don’t immediately see the bed, increasing privacy. Clever touches in the design include a dog leg corridor between the practical galley and dining saloon to prevent kitchen sounds reaching guests’ ears, placing often-accessed technical areas behind easy to open panels to save man hours, a painstakingly planned wheelhouse, a dumbwaiter that carries dirty dishes from the sundeck or main deck dining area to a dishwasher next to the crockery store so they can be immediately put away and intelligent routing in general. Natural light was a major part of the design, with a long window in the upper deck massage room lighting up not only the lobby next to it but also the entrance to the owner’s suite. The interior décor, by a US home and commercial decorator BAMO inc, is Asian influenced and features greens and yellows as well as neutral tones and touches of gold. Central Yacht also gave Boat International a tour of its 56m FB 266 project, also at Benetti’s Livorno facility, ordered by a client who was inspired by Lady Candy. The piping and cabling have already been installed and workers are currently lining the guest cabins with insulation. The project is due for delivery in mid-2015. Based on the same platform as Lady Candy, FB 266 has a similar owner/VIP suite arrangement, but features an aft tender garage where Lady Candy has a beach club and a significantly larger portion of its sundeck is covered.